French Polynesia typically appears on any list of the best vacation destinations in the world. With a whole host of paradisiacal island locations to be explored and enjoyed by visitors of all ages, French Polynesia is a must-visit area for anyone who loves sunny weather, soft sands, warm waters, and island life. One of the best places to visit in French Polynesia is undoubtedly Bora Bora. Stretching out across 12 square miles of land, this little island group is part of the Society Islands of French Polynesia. Formed in a unique, distinctive shape, the main island of Bora Bora is surrounded by a stunning barrier roof and turquoise lagoon, with two big mountains called Mount Pahia and Mount Otemanu in the center. Bora Bora is an exceptionally popular touristic destination with many upscale resorts and hotels to be found all around the main island. Most of the resorts at Bora Bora are focused on water-based activities like snorkeling and scuba diving, but simply relaxing on the beach or exploring the local wilderness are a couple of other popular activities in this tropical island paradise. If you're traveling to Bora Bora by air, you need to know about two key airports: Bora Bora Airport and Fa'a'a International Airport. Bora Bora Airport has the airport code BOB and is located in Bora Bora itself, while Fa'a'a International Airport has the airport code PPT and is located in Tahiti. Bora Bora Airport is the only airport in Bora Bora. Bora Bora Airport has the airport code BOB and is also known under the name Motu Mute Airport. It is located on the island of Motu Mute and has a history dating all the way back to 1943. It was first constructed and opened during World War II as a military installation to defend Bora Bora and neighboring areas from possible invasion or attack. This airport is located at an elevation of 11 feet above sea level and features two runways and one passenger terminal. It is the primary airport for travel in and out of Bora Bora, with people living in Valtape, the biggest populated area on Bora Bora, using BOB airport to get around. Bora Bora Airport once offered international travel to destinations like Los Angeles, but those services have since ceased. Now, only one airline operates at BOB airport: Air Tahiti. Air Tahiti runs flights from Bora Bora Airport to other destinations around French Polynesia like Huahine, Manihi, Maupiti, Raiatea, Papeete, Rangiroa, and Tikehau. This means that the only way to get to Bora Bora Airport is to travel via one of the aforementioned French Polynesian locations. Fa'a'a International Airport has the airport code PPT and is the main airport for the island of Tahiti in French Polynesia. It is located in the commune of Fa'a'a, just a few miles away from the center of Papeete, which is the capital city of French Polynesia. PPT airport is a very important transport hub for the region as it is currently the only major international airport in the area. Fa'a'a International Airport opened up in 1960 and is a hub for both Air Tahiti and Air Tahiti Nui. It is quite a small airport, featuring just one runway and one terminal building, but caters to over 1.2 million passengers each and every year. In some years since the turn of the millennium, Fa'a'a International Airport has catered to over 1.5 million passengers. Many major airlines operate at this particular airport, with some key examples being Air France, Air New Zealand, Air Tahiti, and United Airlines. Some of the biggest destinations from PPT airport are Los Angeles, United States; San Francisco, United States; Paris, France; Auckland, New Zealand; and Tokyo, Japan. 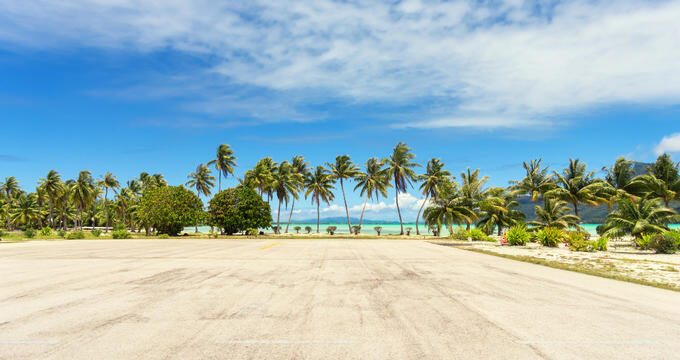 One of the destinations from PPT airport is Bora Bora Airport, and this is generally seen as the best way to get to Bora Bora from an international location. If you want to fly to Bora Bora, it's important to note that Bora Bora Airport (airport code BOB) does not offer any service outside of French Polynesia. This means that the most common method people use to reach Bora Bora by air is to fly into Fa'a'a International Airport (airport code PPT) and then take a secondary flight with Air Tahiti over to BOB. The journey from PPT to BBT takes less than an hour, with the journey only lasting 45 minutes usually.